Don was born January 25, 1935, the seventh child of William T. “Willy” and Della (Fry) Tomblin, in Harts Creek, West Virginia, where his large family and the large families of his uncles and aunts operated adjoining farms. He attended Chapmanville High School and graduated in May 1953. Don moved to Cincinnati after high school and worked at the Sohio station at 950 Tennessee Avenue (now Lykins Oil) from June 1953 to January 1961, and was promoted to Assistant Manager before the age of 23. He also, on January 21, 1958, enlisted in the United States Army. He was named Honor Trainee and served as an Intelligence Specialist. Corporal Tomblin was honorably discharged on December 30, 1959 with a Good Conduct Medal and 7th Army Commendation. He then entered the Army Reserves in the 5th Battalion, 175th MN. BN. and retired as a Chief Warrant Officer. During 1961, Don switched occupations to selling insurance for Prudential Insurance, but within six months found the expenses to be “intolerable.” He then became an Assistant Credit Manager at City Loan and Savings until September 1964; during which time he also attended Xavier University. 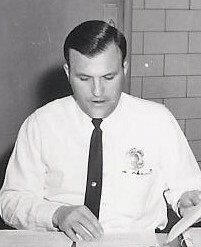 Don joined the Cincinnati Police Division as a Police Recruit at the age of 29 on September 27, 1964. On December 28, 1964, he was promoted to Patrolman, issued Badge Number 737, and assigned to District One (310 Lincoln Park Drive). He was promoted to Police Specialist on July 30, 1972, issued Badge Number PS-184, and transferred to the Tactical Unit. Specialist Tomblin also served in District 6 (3295 Erie Avenue). On July 19, 1977 he was promoted to Sergeant, issued Badge Number S-142, and transferred to District 4 (4150 Reading Road), Communications (310 Ezzard Charles Drive), Gest Street Lot (Gest and Evans), Districts 2 (3295 Erie Avenue) and 5 (1012 Ludlow Avenue), and finally Park Section (5083 Colerain Avenue). He retired January 7, 1990 with 32 years of service to his country and community and 20 letters of appreciation and/or commendation – many for actions resulting in arrests and felony case closures well into his tenure as a sergeant. Sergeant Tomblin was very active in the Fraternal Order of Police, Lodge #69, and served for a time as its Treasurer; a member of the Hamilton County Republican Club, including a ward captain, American Legion, and Mount Lookout Civic Club; and worked tirelessly to establish a library near his home town. He was also an ardent supporter of the Greater Cincinnati Police Museum and did everything he could to bring funding to the Museum through many means, including personal – and always silent – contributions. Sergeant Tomblin was diagnosed in 2013 with Nonalcoholic Steatohepatitis (NASH) leading to Cirrhosis. He survived that, but during September 2016 ended up in the hospital with a difficult heart problem which required a triple bypass to correct. After some harrowing days, he returned home and even called the Police Museum on September 27 to check on its upcoming fundraiser. Then, he suffered a pulmonary embolism and returned to hospital on September 29, 2016. Finally, he contracted stomach cancer that spread to his kidneys. He passed away on Thursday, January 11, 2018, at the Hospice of Cincinnati, 2 weeks short of his 83rd birthday. He was predeceased by his siblings, May Tomblin, Luther Tomblin, Ellen Conley, Florence Brooks, Ben Tomblin, and Ose Tomblin. Sergeant Tomblin is survived by his wife, Hildegard Tomblin; children, Helga (Michael) Riddle and William (Stephanie) Tomblin (Stephanie); granddaughters, Guinevere and Dynalea; and a brother, David Tomblin. A visitation will be held from 5 to 7 p.m. on Friday, January 19, 2018 at the Geo. H. Rohde & Son Funeral Home in Mt. Lookout. An FOP service is tentatively scheduled for 6:45 p.m. Funeral Services will be held at 11 a.m. on Saturday at the funeral home with interment to follow. The family requests that no flowers or items be sent to the family or services, but, that any parties make donations to the Greater Cincinnati Police Museum, 308 Reading Road, Suite 201, Cincinnati, Ohio 45202 or the American Cancer Society.